i try to make a point not to post a lot of mega expensive baby clothing and toys here, but, as you know, sometimes i just can't help myself. that said, i have long admired the shop flora and henri, but never featured them since they fall into the bonpoint category of gorgeous but way too expensive for the everyday mom to buy. little did i know flora and henri have a great sale section on their website! items are marked way down (50% off!). here are some sale items for the summer. 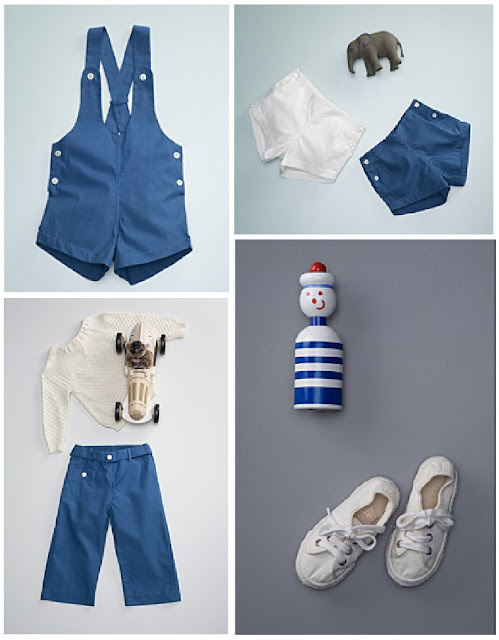 i am a little obsessed with blue and white right now! from left to right: popeline playsuit ($44-$46); popeline pleat short ($39-$43); popeline snap belt pant ($41-$43); and canvas tennis shoes ($68-$71)--ok a bit over the top expensive, but i love the big laces.